spain | Try No More – Go for it! So. Now I’ve had my week/ten days in spain walking a part of the camino norte. I flew to Biarritz. From there I got a bus to Hendaye, still in france. 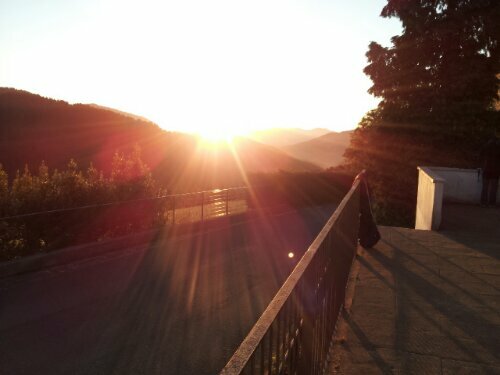 Walked over the Rio Bidaosa that the french/spanish border and finaly I Arrived in Irun. The starting point for el norte. My aim to reach Bilbao was achieved in six days. It was a tough walk with up’s and down and the heat, one day we had 38°, challenged us. I was surprised that I met so many pilgrims. I had a preunderstanding that this camino was less used. But, maybe, as the camino Frances is becomming more and more crowded, specially in august, more pilgrims find their way to the camino norte instead. The first three stops: San Sebastian, Zarautz and Deba, offered great possibilities for swimming in the Atlantic waters. Good for our tired and warm bodies. The path showed us wonderful views and beautiful panoramas. After Deba the path entered the inland passing nice pinetree forests and eacalyptus trees. One evening we visited a recommended restaurang in Getara, El Cano, said to be the very best fish restaurang in the basque county. It was! The local white wine, Txacoli, accompanied the fish. Never had it’s like. A curiosity: El Cano was the first to make a global roundtrip with a ship (1519 – 1522) under the captain Magellan, who died in Singapore before comming back. El Cano came back to spain and was a hero. Back to track. Pinchos is the north variant of talas. They are served at many of the frequent bars along the camino. Bars that serve as places for break fast as the albergues seldom have breakfast. There are many small streams following us as we go and it’s a treat for the feat to go in the cool fresh water. Before comming to my destination Bilbao we stayed in Gernika. The city was bombed and totally destroyed in 1936 by the fascist. Picasso made the famous Guernika of wich there’s a copy i Gernika (the original is in Madrid). To se the big fresc closer up made a big and strong impression on me realizing the horrors and tremors of war. To end this years short camino was Bilbao the goal. Casco Vieja, the Guggenheim museum, Rio de Bilbao. The camino give me many occasions for reflecting on my own, collecting energy, meeting with people from many places round the world, talking, listening to stories from life, how different the stories are and how equal we all are. The local people are extremely helpful and acts as wonderful exampels to copy. It is a lesson for the life and for living. Going back and leaving the camino is a sadness story, leaving the new friends and seeing them continue is hard. Next year I wish to go back and finish all the way to Santiago de Compostela. Meditative, monotonous, long views, lonely, reflective, memories rise to the surface. Tears. 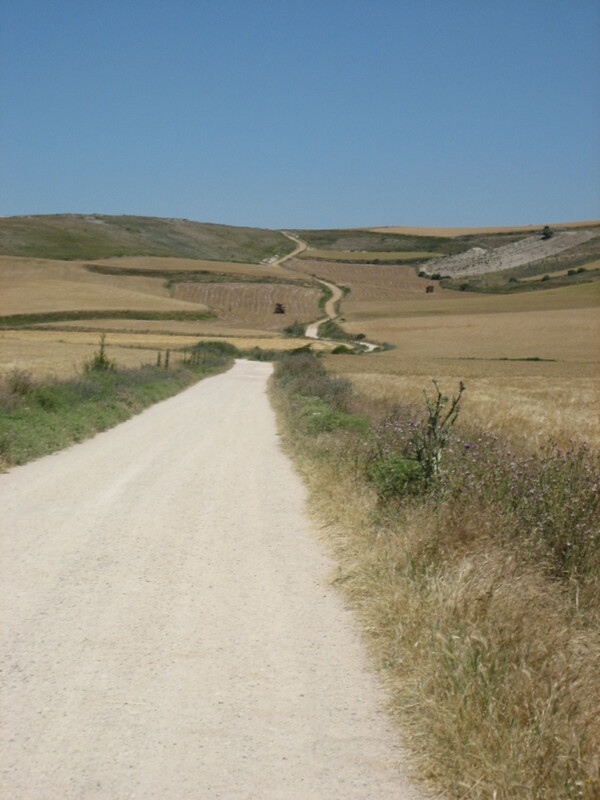 He walked on the Meseta in spain. Slow. Weat. Warm, hot and the feet gets swollen. Yellow arrows. He missed one and had to go back again (lesson!) Watch for the signs. Small, calm villages with a fountain for drinking water. Sit down, café, bocadillo con keso. A chapel and a choir. The hills and a narrow path. The hat is a must the stick is not. Balance in every aspect. He’s feet begins to protest. How far must we walk today? He takes a rest underneath a tree. Lying in the grass. Up again. Stops by a river, dips his feet in the cold water. Refreshing. Small fishes. On and on. Not there yet. The goal is not far. He can see the village now. Accelerates. Every step hurts. He’s looking in the distance – longing for the rest, longing for the rest. When arriving in the albergo in the afternoon he cares for the blisters. Cleaning clothes and mind. Getting ready for tomorrow and the next days. Later dinner with fellow pilgrims. Talking, sharing, listening, supporting, watching and writing the diary. Early night – tomorrow is another day. A happy man is in port.